Vegan Eats and Treats! : Big Fun Food Day! Ta-Dah!! Wow! I have been eyeing the crepe recipe in VwaV for quite a while now... and finally I made them! I reduced the salt a lot and used canola instead of olive oil, to make them a little less "savory." When I was little, whenever we had special breakfast, it was always crepes (never pancakes). So crepes have a special place in my heart... and I've missed them since being vegan. Miss no more! These were GREAT! I was dancing around with happiness as I ate them. I filled them with my fresh raspberry jam from last night and rolled them up. Yum yum yum. I cannot strongly enough recommend this delicious item! 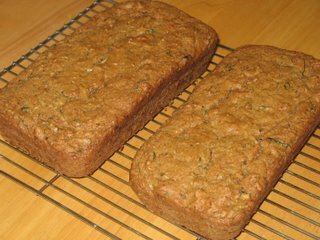 This morning I made two loaves of zucchini bread. It's an old recipe I got from my mom and it's really good. I made one loaf for my 15th High School Reunion barbecue today, and one for my Yoga Book Club meeting tomorrow. 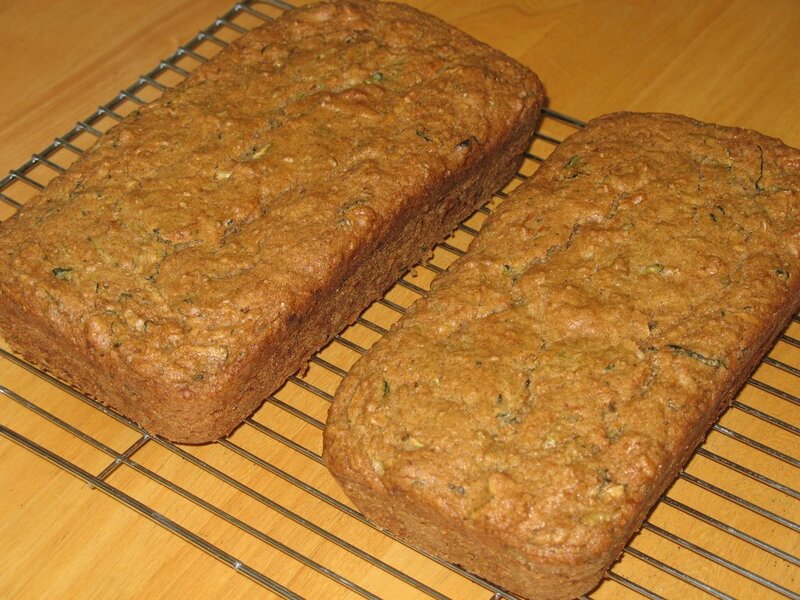 This is an old standby and a good use of 4 cups of grated zucchini! 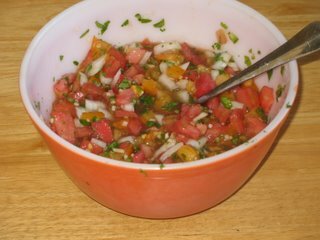 Today I did something I hadn't done in a while... made my own salsa! I got this Pico De Gallo recipe from "Vegetarian Cooking for Everyone" by Deborah Madison. It's a great recipe - easy and totally delicious. We've got a lot left over, so I'll have to think of something to use it on in the next few days. Mix it all together and let stand for at least 20 minutes or so for the flavors to mix together. 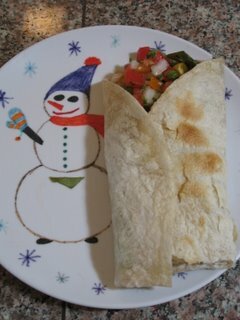 Here's the finished burrito... YUM! In addition to lots of fresh salsa, there are some veggie refries (with loads of cumin and salsa added in), some chopped up yellow cherry tomatoes, and a bunch of chopped up lettuce. Really, really good. Tonight for dinner I made "Green Beans Almondine" from a recent issue of Vegetarian Times... it's one of those "5 ingredients" recipes. It was pretty good! Turn oven to 350 & toast 1/2 - 3/4 c slivered almonds for about 9 minutes. Set aside. Steam 1-1 1/2 lb. 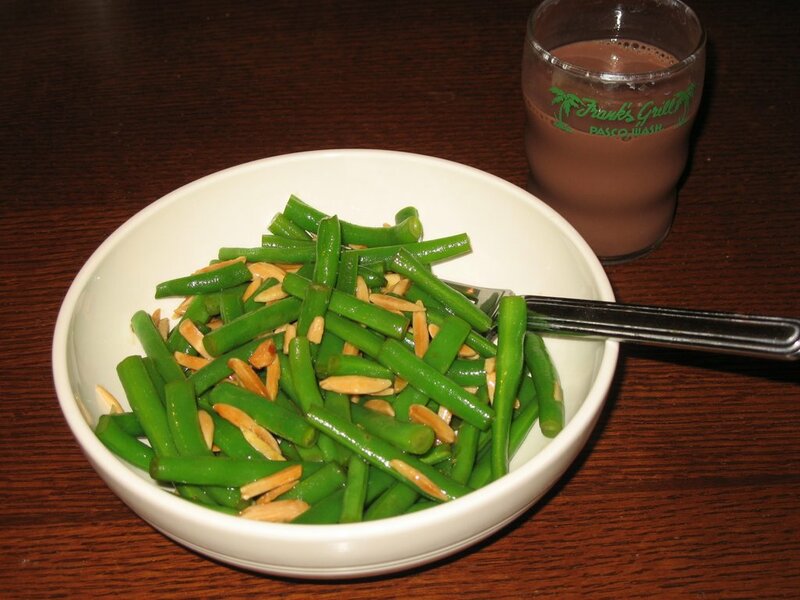 green beans until tender crisp. cool & set aside. Then, add in the almonds and enjoy! It's a nice little side dish, and a tasty combo of flavors. Those crepes look awesome! 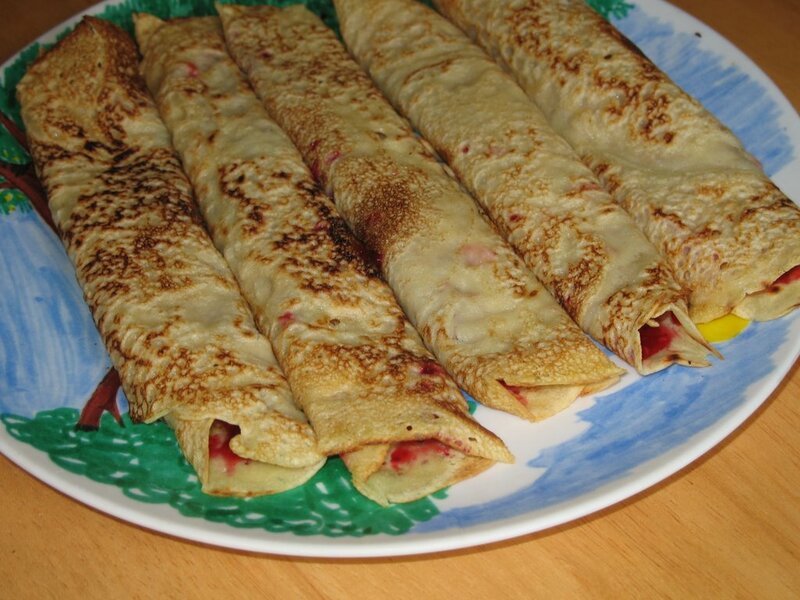 My grandmother used to make crepes rolled up like that and filled with jam for me when I was a kid. I try to make crepes every once in a while but always with mixed results. And thanks for posting the green bean recipe. We're finally starting to get green beans in our garden (that's about the only thing that looks decent back there now). you are eating very good aren't you? i have been eyeballing that crepe recipe.. but, was very very skeptical.. now i know they really do work.. and look awesome! as does the rest of you food! Yea, the crepes were great! Even my omni boyfriend agreed that they were every bit as good as any crepe has ever been! How sweet that your grandma used to make you crepes... Isn't it interesting how our friendly associations with food really add to the eating experience? Also, regarding green beans... do you have the "Vegan Meditteranean Kitchen" cookbook? There's a green bean-potato salad recipe in there that is my all-time favorite way to eat up green beans. Let me know if you want the recipe. Yeah, we are eating well these days. I find it easier to eat well in the summertime, with long days and so many beautiful veggies. Plus, I've gotta fatten up before I take my vegan self to Serbia/Bosnia/Croatia in about 9 days! :) And you should definitely cook up those crepes, you won't be sorry! !